Craving a delicious snack? 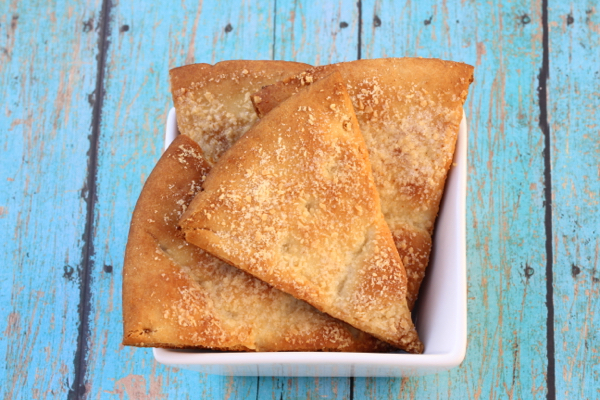 This Garlic Parmesan Pita Chips Recipe is perfect for the occasion! Cut Pita into 8 equal pie sized pieces using a Pizza Slicer. Brush melted Butter on both sides of each slice of Pita. Place on Cookie Sheet and evenly sprinkle Garlic Salt and Parmesan Cheese on Pita. Bake at 375 for 10-11 mins, or until done. Remove Pita Chips from Cookie Sheet immediately after removing from oven to ensure the chips do not overcook. Let cool 30 minutes… then eat like crazy!